Why purchase a ring and a bracelet when one item can do the trick? I've been noticing more and more hand chains when I browse online shopping websites, and I must say I do like them. Like the recent resurgence of the anklet, the hand chain harkens back to a bohemian jewelry style that is making a comeback as of late. Hand chains are edgy and dainty all at the same time. 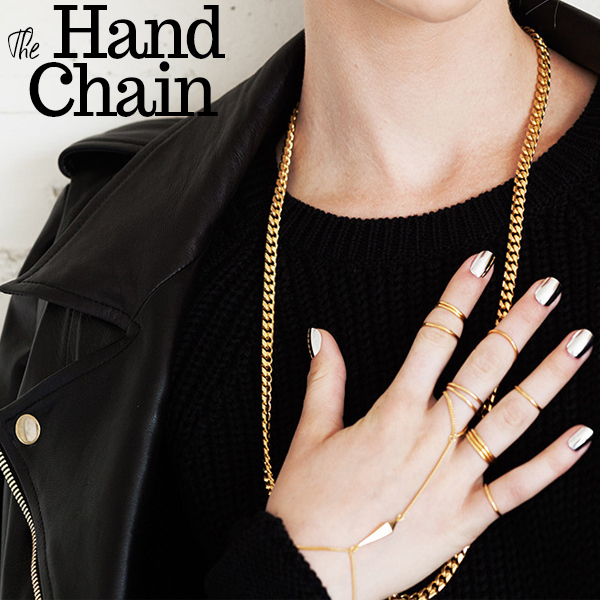 They are delicate in that they are composed of thin metal chains, but the overall look of a hand chain is completely unique. One could wear a simple LBD and elevate her cool factor by adding a cool hand chain as her key accessory. I wouldn't try to upstage such a unique piece of jewelry with loud prints—that is, if you want your cool new trendy jewelry to be the center of attention. Personally I feel that hand chains look their best when they are worn alone, rather than mixed with additional pieces of jewelry. If you insist on having a hand/arm party a la The Man Repeller, then I would suggest mixing and matching rings and bracelets on the other arm. Additionally, the hand chain is definitely a piece for a night out, though it would be just as cool to wear it unexpectedly during the day with a casual look. Hold onto a cool clutch or a sleek iPhone case and you'll be sure to draw plenty of attention to your new bling.